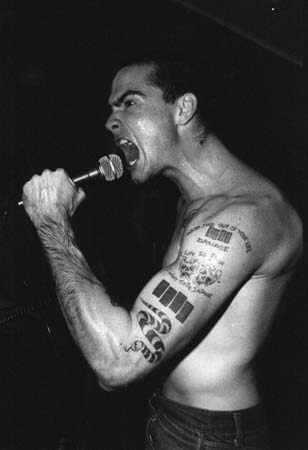 The Red Thread Between Nothingness And Eternity: Flash Writing and Found Music: Tonight: Black Flag! My voice is pretty ragged due to a rigorous rehearsal last night for tonight's Black Flag set at Ralph's Rock Club. Yes, at mid-life I get a chance to vent my unresolved adolescent angst in a tribute to one of my favorite bands of all time. This should be fun. I am not the man in the picture above, but I'll try my best to do him proud. Don't worry, I'll keep my shirt on.